Great build quality, great video transfer. If your device has a flat side, this is definitely the adapter for you, but possibly one to avoid for angled devices like a Surface. At first glance, the design of the product is sound. However, there are a couple of issues that can cause problems for some. First, the connecting cable is a strange length. It's too short to keep all pressure off of the device's port, but too long to always be able to keep it from being pulled off of a flat surface, like a desk or shelf. This can cause strain on the device port itself, which could, with time, cause permanent damage. It would be easy to prevent that issue by keeping the HDMI cable pulled close to the device, or place the device on top of the cable. When used with a Surface Pro, we wrapped the cable under the kickstand to prevent stress. Second, the length of the plug is slightly short. Again, when used on the Surface Pro, which has an angled side panel, the plug fit completely and worked, but did not always stay in place. The pressure from the cable pulling downwards pulled the adapter out of the tablet twice. This will only be an issue for certain devices, however. If your device has a flat side, you are likely never going to experience the issue. However, if your side panel is slanted, like the Surface Pro, you might want to consider a slanted adapter. On the other hand, one issue that is common with these adapters that we never experienced was the HDMI cable pulling out of the adapter. This port was solid and tight, preventing the plug from coming loose, meaning you don't have to try again during a presentation or movie. Lots of adapters in this price point, especially products aimed at a consumer market that needs the adapter to make a device usable, fail on their build quality. With the Accell adapter, however, does not follow that trend. In fact, the physical quality of this adapter is close to that of a professional product. At no point did I feel like it was going to twist, fray or break. A similar product in the same price point that we previously used in our studio, purchased from a different manufacturer, broke after only 2 away shows. We have now traveled with this adapter for several months without any issue. As far as functionality, the most important part of this device is, of course, the picture quality. While using this, there were never any lines or interference in the picture, there was never any resolution drop or anything that would make this adapter a concern. The only things that made functionality an issue is covered in depth under Design. But, like we said in that section, so long as your device does not have a slanted side panel and you can secure the cable, don't let those issues affect your decision to purchase this adapter. As compared to some other adapters we have used in this price point, this one is a little heavier than most. The good news is, that weight is actually a positive. The weight comes from the Build Quality - because this adapter is made of sturdier materials and has a better HDMI port, it also comes in weighing just a little bit more. Personally, the difference in weight here was not enough to make it annoying to carry, nor did it feel like the weight would cause any trouble for the device itself. 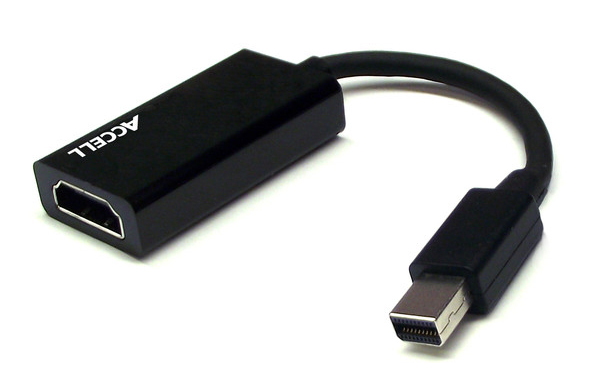 Because of the nature of DisplayPort to HDMI, digital compatibility is not an issue here. If the device supports any DisplayPort up to and including version 1.2, this adapter will work for you. The only compatibility issues raised here have to do with the physical design of the DisplayPort plug. As discussed in the Design section, the plastic molding makes the plug itself shorter than some devices can use. The Surface Pro, with its slanted side panel, was able to use it, but it stayed loose and fell out on two separate occasions. Most devices will have straight side panels, though, meaning that the compatibility issue raised will not affect most people.